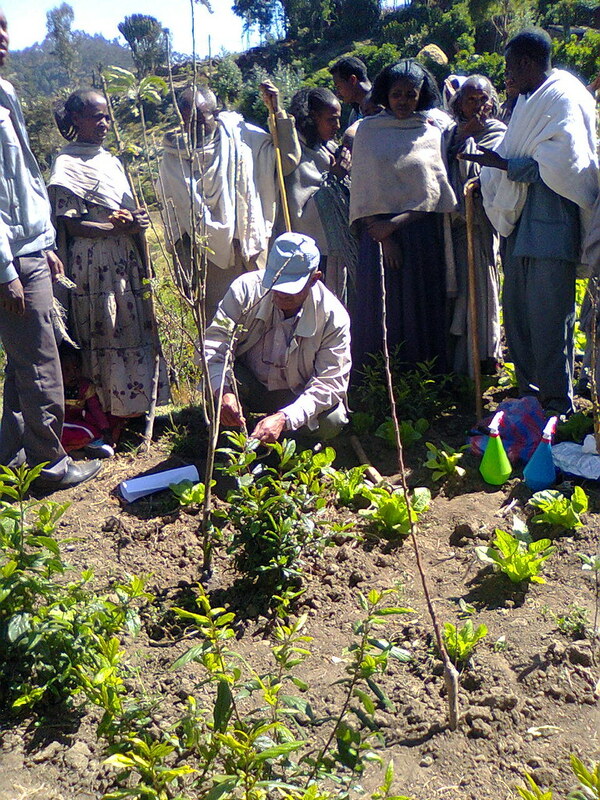 Practical demonstration on Mulching, pruning & micro basin construction in Debre Birhan Gudo Beret (Photo credit:ICRAF). In January and February this year, ICRAF and partners from the Africa RISING Ethiopia project ran training in apple tree management at three sites (Endamehoni, Sinana and Debre Berhan). 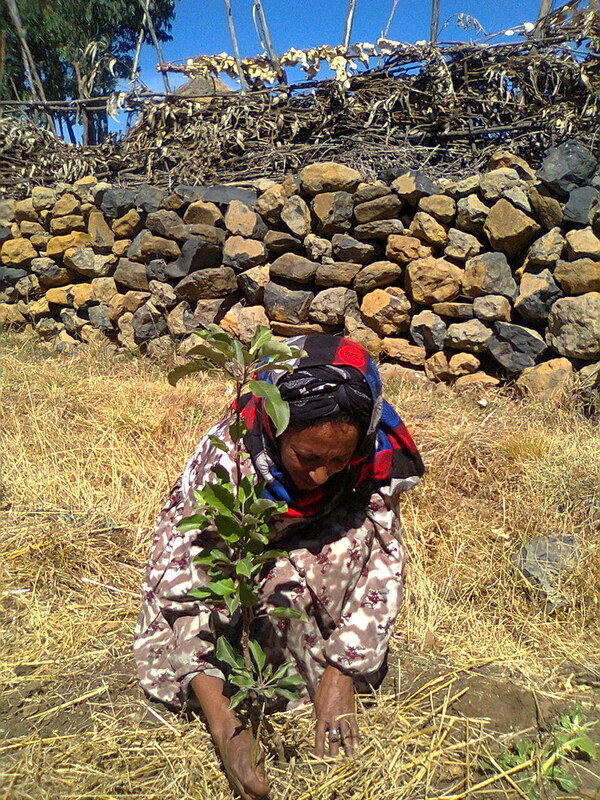 The training followed earlier distribution (in August 2014) of 1,500 apple tree seedlings to 150 farmers in six kebeles (25 households per kebele). The aim of the activity is to increase family income and to improve nutrition and food security. participatory survival and growth monitoring of the planted seedlings and identify site specific opportunities and challenges. Field observation showed that most of the apple saplings were growing well. Apple seedling survival rate was above 85% in all the sites. Most of the target farmers have practiced irrigation, fencing and light mulching to manage their apple trees. Apple sapling in Ilu-Sanbitu (Photo Credit:ICRAF). In general, in all the sites, the farmers value their seedlings and many wanted to plant more trees, including farmers who did not get seedlings last year. Farmers in Illu-Sanbitu kebele were especially keen – the ‘apple’ farmer group in this kebele has a regular co-learning meeting and field monitoring schedule to visit each other at least every three weeks and they take corrective actions for those who are not managing their trees well. In one case, a farmer was seen to not take proper care of the apple plants and the group transferred management of his plants to his daughter. Generally, in all the field sites, apple seedlings managed by female farmers performed better than those managed by male farmers. This could be due to more women’s engagement in homestead farming. In fact, fruit trees are very important in women’s daily lives, especially for food, nutrition and income. This indicates the importance of specific niches where women and children can really gain a foothold in a new intervention. Some of the challenges observed were site dependent. Lack of knowledge on apple management was critical in all the sites and at all levels (farmers, development agents and government officers). Farmers in Tigray worry about the longer-term as they can see apple trees planted by another project six years ago infected by woolly aphid, powdery mildew and apple rust. This makes farmer’s worry about the success of their efforts and whether the new trees will be contaminated. The project is working closely with relevant local partners to eradicate the infestation, stop dissemination of infected seedlings from nursery sites and provide close follow up and training. In Gudo Beret, some farmers were seen to be negligent in managing their apple trees so the team comvened a meeting to provide feedback and raise awareness and ownership of the trees. The farmers promised to improve their poor management practices and show well-managed trees within the coming 3 months. They also noted that they need technical support and follow-up from the team in all agronomic aspects. In Goshe Bado, farmers are well engaged but struggle to keep wild animals – birds and apes from their old apple trees. In Sinana, most of the apple saplings planted at the farmer training centre in Ilu Sanbitu have not been well irrigated and fenced and further support and training is essential. Further consultation with relevant regional and woreda implementing partners is important to properly prioritize and organize capacity building and extension activities. There is a huge demand by the farmers to plant fruit trees; hence the ongoing research to identify proper varieties and management practices. Capacity development of farmers and government bodies at all levels should continue in order to scale up and promote the importance of temperate fruit trees widely. 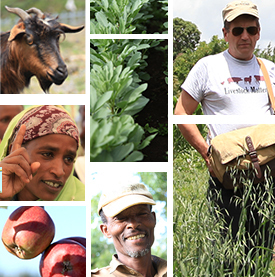 In addition to ICRAF, the training was supported by many partners including Ato Abiye Astatke who owns an orchard. The Africa RISING site coordinators played a great role in facilitating the training process. The training was also supported by staff from Medawolabo and Debre Birhan universities, Sinana agricultural research center and Endamehoni, Sinana and Basona Wosena woreda agricultural offices. Abayneh Melke, a PhD student supported by the project also contributed to the training. Tags: apples. Bookmark the permalink.